RIVERSIDE, Calif. — The quest never stops for Riverside Community College Head Coach Dennis Rogers. Over the years this highly successful skipper, who has led the Tigers to four California Community College titles, has brought in people from all walks of life to give his teams an insight into how excellence can be achieved. His latest fabulous speaker was Alex Honnold, the greatest free solo climber in the world who talked to his team recently about the mental mine field he endures each time he tries to scale the face of a mountain. Free solo climbing is without question the most dangerous sport in the world and involves scaling massive rock walls virtually straight up without any ropes or protective gear. Only a few brave people in the world even attempt it. The remarkable ascent of a free solo climber involves a person with no fear as he utilizes his shoes, fingertips and tremendous mental focus searching out small cracks to grab along the way. This extreme form of climbing appears to be a suicide mission in waiting. The rock walls he scales throughout the world are incredibly intimidating. With this treacherous type of climbing, one slip, one heavy wind gust, one lapse of concentration, and you are history as you fall thousands of feet to a horrible death. With free soloing, you have no partner, no safety net…nothing. At the age of 23, the 5-foot-11 Honnold pulled off an amazing feat by scaling the towering northwest face of Half Dome in September of 2008. This nearly 2,000-foot granite wall towers above Yosemite National Park. And before Honnold free soloed this wall, nobody had ever contemplated doing it before because of the danger. To give you a perspective, the height of Half Dome is almost the same as the Empire State Building in New York City at 102 stories. And Half Dome is such an imposing vertical climb that attempting to reverse his climb downward was out of the question if he got into trouble. There was only one direction he could go…up. At one stage of the climb, he actually froze because of the difficulty. But after gaining his composure, he focused intently and climbed his way out of trouble and to the top as he made history. After seeing The Ascent Of Alex Honnold on “60 Minutes,” Rogers became obsessed with tracking Honnold down to ask him how he is mentally able to climb in this fashion and share this knowledge with his baseball players. What Rogers found was an engaging personality who mastered climbing in a precision manner. While baseball players today at a young age don’t practice nearly enough to master skills and instead play game after game on the youth level and on club teams, Honnold trained to climb indoors for about six years before he ever ventured outside to climb on rock walls. At the age of five, his mother Dierdre Wolownick took him to a climbing gym in Davis, Calif. where he started scaled a wall immediately. At the age of 10, his father Charles Honnold began taking Alex to a climbing gym in Sacramento. “In talking to Alex, he got mesmerized by learning everything he could about climbing,” said Rogers. “He wanted to master the inside gym before he ever went outside. Let’s relate this to baseball and how our youth programs work. The way we do things on this level is play game after game without practicing and honing the skills necessary to be better. What Alex did makes perfect sense. “Let’s teach young kids how to throw, how to field a ball and swing a bat. Let these kids grow and curtail the games until we can master those concepts. That was the big point I took out of Alex Honnold. He mastered what his body was supposed to do. This was over the six year period with body growth, hormone changes and other dynamics before he went and played a ‘game’ on the big mountain. Rogers was asked how young baseball players can specifically master the mechanics of the sport and how much time he thought it would take. “Teaching starts with the parents. They help with their kid’s education which is a high priority. But their development in other areas, including sports, is essential as well. “And parents must learn to slow down the entire process. Get a perspective and take the emotion out of it because your son is five years old. Let him be a kid as well as learn something. “I feel coaches must be trained better on the youth level as well. Youth coaches must learn not only how to instruct young athletes but understand and communicate what total development means. Rogers said that it was fascinating studying Honnold. “With a team sport such as baseball, you can be covered up by team dynamics. The rightfielder can have a bad day while the team could do well. And he can be protected from his failures for that day. But in an individual sport such as free solo climbing that Alex does, you are the team psychologist, motivator, nutritionist and so on. You are the whole team. That to me says right there that it takes a lot more mental toughness and mental preparation and recoverability mentally than any team sport scenario. Rogers said Honnold already had a passion for climbing before he climbed a mountain for the first time even though he put in years of focused practice time to be skilled at his craft. “With many baseball players, you don’t see this passion emerge until they are 27 or 28 years old. When they have this passion, they don’t question anything. They have a game plan and know it inside out and top to bottom. “In watching Alex go through the process of free soloing the side of a mountain wall on the ’60 Minutes’ telecast, he analytically studies all the cracks and crevasses as he climbs it with ropes in previous ascents. As he goes up the face of the mountain with ropes, he then makes adjustments and re-climbs it over and over again until he feels that he can free solo it. Rogers said when Honnold comes to a point in a climb that becomes extremely difficult, he turns the music off, stops talking to friends and becomes more diligent at the task at hand. Rogers said it would be remarkable if baseball players could focus at this high level immediately when they needed to without adrenalin coursing through the body at a higher level as the athlete remains calm like Honnold. It would change the dynamics of the game. After all, a baseball game involves several hundred starts and stops with many players not totally focused at different segments. Rogers said if you compressed a typical game down to only the action involved, it would be about 12 ½ minutes. “When do we really talk about the mental game in baseball? Who is the mental instructor? How consistently will we work on it? Do you really believe in it, and do you really want to apply it? In our program, we do run mental propaganda. We use Geoff Miller (Atlanta Braves’ team psychologist) individually and collectively with the team. We also use Ken Ravizza’s Heads Up Baseball book. We use Dr. Bill Harrison in regard to baseball vision. It was brought up to Rogers that the training philosophy of Honnold mirrored an extremely important point that author Geoff Colvin brought to light in his book Talent Is Overrated. He studied world-class performers in many disciplines and found that practicing in a precision manner on a regular basis for 10,000 hours or 10 years was absolutely essential to their development. This “deliberate practice” where they intensely focus makes them the performers they are. He also found that there becomes a moment when motivation be-comes internalized, similar to what Honnold has done. Then what he does is his own quest and pursuit. When that happens, it typically isn’t a goal that is driving him. It is because there is something in the activity itself that he finds rewarding. Whatever that comes from is what really separates world-class performers from everybody else. “You’ve really hit on something. Alex Honnold is the only world-class athlete I have ever met in my life who has devoted the 10,000 hours to refining his talents to pursue excellence. This drive to have intense focus such as Alex has usually starts at a young age. It doesn’t happen in the late 20s or later on in life. Then these kids accumulate all these hours of focused practice. “When I talked to Alex privately, he doesn’t have a lot of distractions. He has a family in Sacramento and has a girlfriend. He has his van and dresses casually. Even when he spoke to our team, he dressed in mountain clothes. My point is that he eliminates all the things that don’t allow him to do what he wants to do. “The minds of baseball players are divided. They constantly think about the reaction of their parents, other recruits being brought in, if they will retain their scholarships and things of this nature. “Alex gets to his greatest mental focus level when he is simply pursuing excellence. So he eliminates all these distractions and keeps his life basic and simple. He has one purpose which is to climb around the world. He always goes back to Yosemite as his checkpoint. Alex finds out how much he has improved and how good he has become. He feels Yosemite is the best place in the world to check himself because of the difficulty involved. “His talk to our players at Riverside was very revealing. Alex mentioned that he didn’t know if he could play baseball and have to perform on cue over the over again in games. The players got a big kick out of that. If a pitcher fires a pitch, it is either a ball or strike or contact with the bat. But if Alex makes a mistake free soloing on the face of a mountain, he dies. He doesn’t have another option like in baseball. “It was amazing to hear him say that his heart rate would probably get much higher in baseball facing pitch after pitch. But here he performs the most dangerous sport in the world where you can die with one mistake, and he doesn’t dwell on that. He doesn’t think of the negatives in climbing. Alex only thinks about what he is trying to accomplish on each climb. Rogers was asked if Honnold told him the age when he became self motivated. “While he worked at climbing since the age of five, Alex really became passionate about it at the age of 16 when he went outside and started scaling rocks. He knew he could do this because he had the previous training for a number of years and could do it without any fear. That’s been his pursuit since. “His demeanor and calmness is amazing. He also has drive and ambition that is second to none. That’s how Alex pursues climbing. He doesn’t think of the end result or the accolades. He just thinks about the accomplishment of climbing and where the next challenge is. Rogers was asked if Honnold is the type of athlete who is focused on what he can’t do well which Colvin said was an integral part of a world-class performer. So many people are undisciplined in practice and only like to do what they can already do well because it is rewarding and feels good. “He explained that when he gets into a difficult situation where he has a concern, he will go back multiple times with ropes while climbing to figure out how to solve the situation prior to a free solo climb. “He wants to know where he can put his foot placement better on the mountain wall and if its a technique problem. He is very analytical and has been tested as a genius. His mind works differently than mine. He sees things very differently and deeper than baseball players. “In the ’60 Minutes’ story, he was telling the interviewer that he was going to go up the face of the mountain at Yosemite in a precise route. If you have ever been to the top of Yosemite, the height is staggeringly high. I have seen the top of this area with binoculars, and I couldn’t tell you how to get there. He had it totally mapped out in his mind, and it was amazing. Rogers mentioned that Alex will scale the side of a mountain 7-10 times with ropes and protective equipment to map out his path prior to a free solo climb. “He has a special journal that he writes information in after he goes on these exploratory climbs. He writes down what route he will take and where his foot placements will be along with rock outcroppings and crevices to grab with his hands. He has maps of everything he climbs. “It would be just like a hitter keeping a hitter’s journal or a pitcher having a pitcher’s journal. By utilizing this journal, he can tweak a climb and make adjustments after so many practice runs with ropes before the free solo climb takes place. He said that once he climbs a mountain several times, he can see the route he wants to take, feel it and anticipate where he will free solo a week before he actually does it. “In other words, he gets a great visual picture in his mind. Once you get that, things get a lot easier to do. It’s advanced on one level. But on another, it really isn’t. Baseball players who utilize visualization like this have a tremendous edge. Baseball needs to adopt what Alex Honnold has taught us. We simply need to utilize these concepts. Before Honnold came to talk to his players, the skipper at Riverside Community College rented a climbing gym for his players for several hours so they could experience how difficult climbing is. “It was amazing how the guys just stayed there. Some were a little bit better than what they anticipated. Some guys had fear, but they kept pursuing it and pursuing it. I realized if they understood what Alex had gone through, they would be able to ask him good questions when he showed up. Rogers said that players don’t want to hear their coaches talk all the time about excellence. “So why not have your players hear from great people in their chosen professions? Aren’t you ultimately trying to make your program great? “One of the things I plan on doing is having our players read chapters in Steve Jobs’ book (written by Walter Isaacson). They will find out about his creativity, his mind and adventures. He was a brilliant guy but not really a great person. But you know what? The great ones are a little whacked anyway. 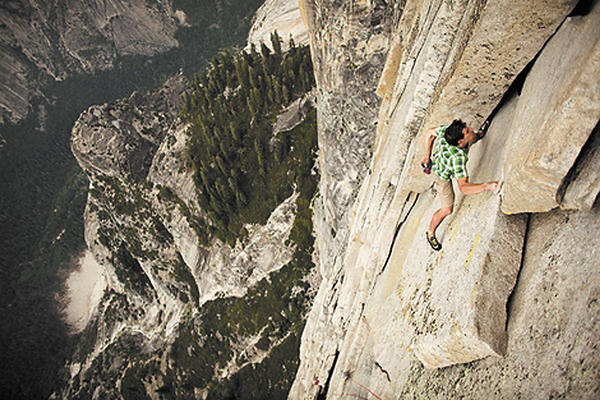 Honnold faces extreme challenges while he is free soloing on a climb. He might experience unexpected rain or be startled after putting his hand in a crevasse with a bat flying out which could cause him to fall. Maybe poisonous bugs could bite a finger as he grabs a rock outcropping, or he could be hit with unexpected winds. Alex must always be prepared for the unexpected during climbs. Baseball players face many unique obstacles during games as well and must be mentally tough to overcome them. “He has a pretty calm demeanor about him. But I didn’t hear him ever bring negativity into his conversations of doing a free solo climb. If he has to adjust, he will. If there is water there, OK. He has a plan if he does run into wind, heat, bugs and a whole bunch of elements. Anything negative that may happen, he has already played that through his mind. But he doesn’t publicly talk about this. He has been climbing for so long and has a great ability to block these negative thoughts out. “As far as baseball, wouldn’t it be great if players had the ability to block out negative thoughts? All of us in the game have been trying to answer that question for ages. When negative thoughts come up, how can you eliminate them right there? “There are very few players who have that ability. The theory has been out there that it might be better to be dumb when you play baseball because you won’t over think situations. I have always felt that is a stupid theory because you always have to think in this sport. “I have always believed that smart wins in any athletic event. Talent is important. “There is no question about that. But the smarter the talented individual is, the longer he will sustain his game. I have always felt that if you struggle in the classroom, then you will struggle on the diamond. And history has shown this to be true. “Alex’s thought process is different than anybody else. His ability to pursue new things and critique himself privately allows him to work at being better in those skills. He pursues his own personal excellence and doesn’t worry about anybody else. Alex is really driven by not being the best but being the most creative. You just don’t find those of people very often. “There have been very few people in life who have moved me.